Tonight’s dinner was rrreeeeaallly easy. And more importantly, it tasted good too! It was like making a homemade hot pocket. 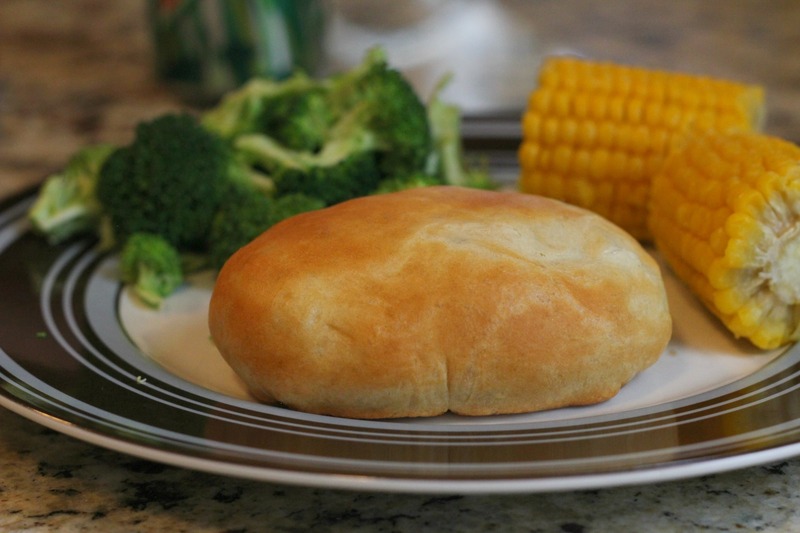 A very delicious hot pocket that’s actually heated equally all the way through…unlike the store-bought hot pockets that are always still frozen in the middle, even though the edges are piping hot. This recipe is one that enables you to really make it unique by adding your own ingredients of choice to the cream cheese filling. I happened to have a packet of dry ranch dressing mix, so that’s what I put in mine. You may try putting cheese, bacon pieces, onions, buffalo sauce, or any number of things to tailor it to your family’s tastes. If you’re feeling really daring, you could split up the cream cheese into 4 different bowls and put different ingredients into each one. Then when you fold it up and bake it into your bundles, it’ll be a surprise which flavor you get! It’s like the Russian Roulette of dinner. So first you’ll take a can of crescent rolls and roll the dough flat on a lightly floured surface. Then separate the dough into 4 rectangles. Use your fingers to spread the dough out thinner and pinch together any tears and holes. Once you’ve decided what you’re going to add to the cream cheese, mix it all together and throw in some cooked chicken. Then spoon it onto the dough. Now you’re ready to make it into a little bundle. 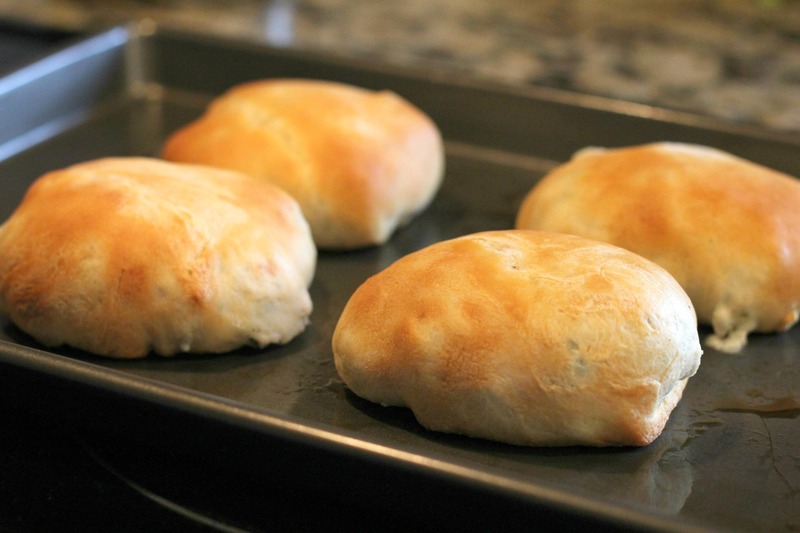 Just fold up the dough around the filling and pinch the seams together. Place on a lightly greased cooking sheet and bake at 375 for 15-20 mins (or until golden brown). Here they are straight out of the oven! They look like oddly shaped biscuits or something, but they sure do smell good! I put mine seam-side down so that the tops would look all clean and smooth. And there it is! My own homemade hot pocket! I really liked the flavors that the dry ranch mix gave it. Let me know what ingredients you put in yours and how it turned out! I’d love to hear about your different combinations! 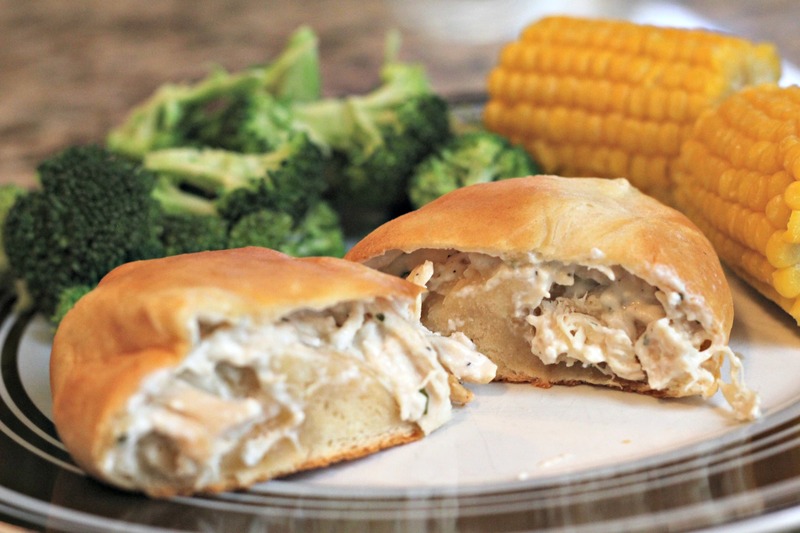 Combine the above ingredients (minus the crescent rolls) and mix well. Open package of crescent rolls. Do not divide into triangles. Keep every 2 triangles together, forming 4 rectangles. Pinch the seams closed and pat each one out into a larger square. 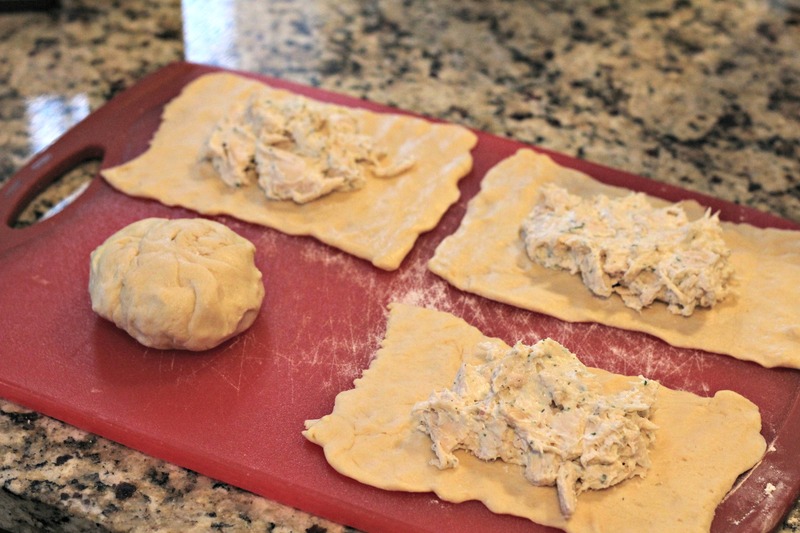 Put 1/4 of chicken/cream cheese mixture into the center of each square. Fold the corners up into the center, pinch the seams together, and make sure it is all sealed. If you want a crispier outer crust, just brush an egg white onto the dough before you put it in the oven. You will also need to reduce the cooking time a little so it doesn't get too hard. Thanks! I just love recipes that are super simple and use ingredients I often already have!